Following some repairs on the hydraulic lines, I discovered my steering and brake assist was gone. DejaVu way back to my work diagnosing hydraulics. 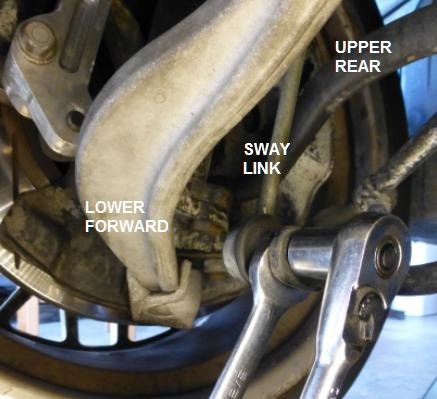 We know that if the steering box passes high volume, then it pulls the entire system down the volume-pressure curve, eventually taking out the brake assist also. The fastest, surest way to determine if it IS the steering box that is messing up is to swap it out for a know good unit. 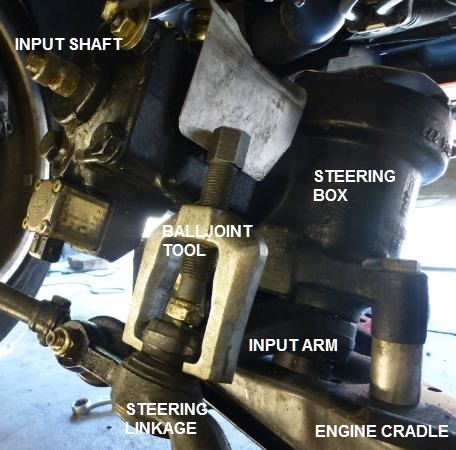 This writeup is my most recent, cleanest path for accomplishing a pull of the steering box. 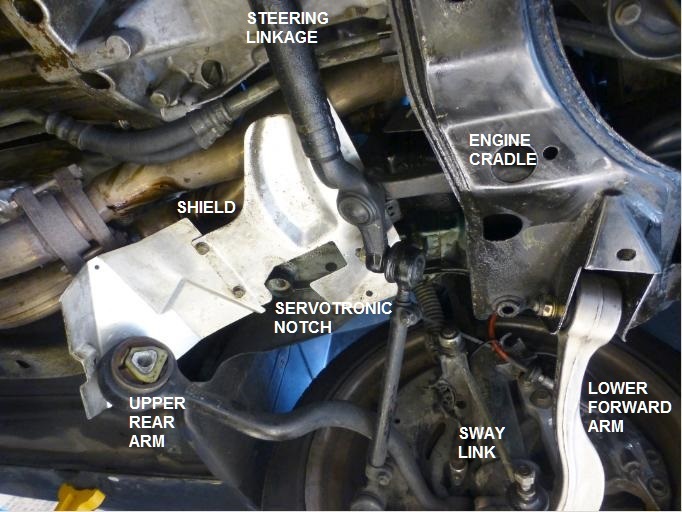 This updates and replaces the "pull" preamble previously found in the thread HowTo->Overhaul a ZF steering box. Here, more comprehensive with better pics. My estimate would be 2-3 hours for a first time novice, 1.5 hours for an organized talented owner, and no more than 45 minutes for a professional tech on game day. Same numbers again for putting the box back. The vehicle shown herein is a 1997 840, with X-frame and servotronic. 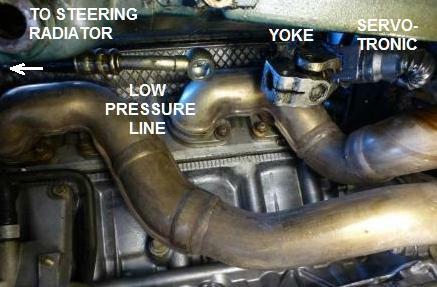 The 850 and other years may differ slightly in steering box and hydraulic lines. Very early years will not have the X-frame. 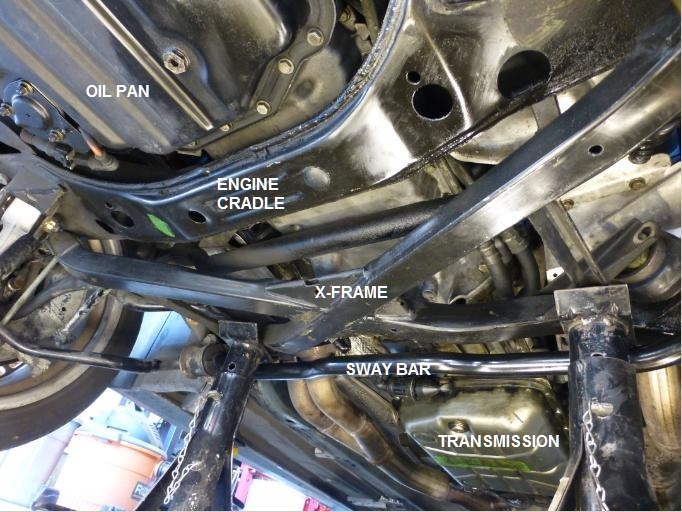 This to gain access on this low clearance vehicle and because we will be removing control arms making the front suspension incapable of supporting the front end. 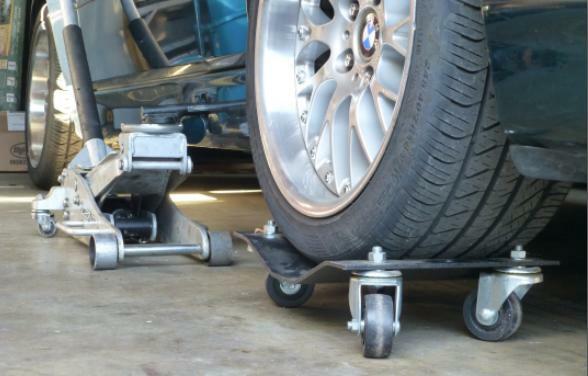 Although the front wheels can be left on, and that is how it is shown herein, it is suggested that they come off, to eliminate the weight as the struts get pushed around. Not shown, jackstands. You will use them. Takes 8mm allen. And a bucket. Takes 22mm socket and 15" minimum of extension. You didn't forget the pan, did you? 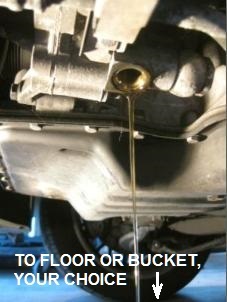 Shop tip: Whenever opening ANY connection, assume fluids will come out. Same applies when you even slightly move an open line. Same applies when you overturn the steering box. 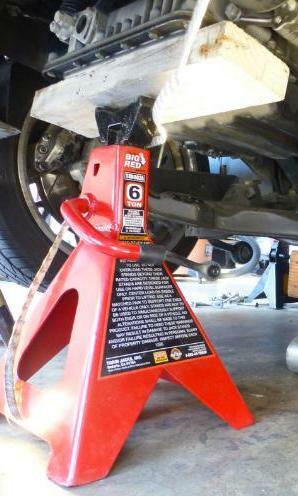 Support X-frame, jackstand option shown. 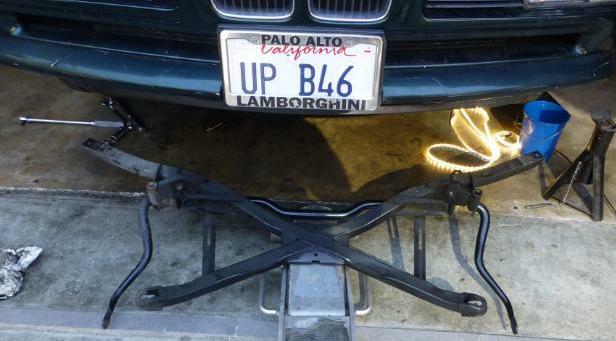 With sway bar, if weighs about 25 lbs. On the way back in, and knowing the weight, I was able to bench press it into position and get bolts started. Left side shield has a notch, when the servotronic is present. - Body, with relatively large washer. - X-frame. Relatively short, like 8mm. 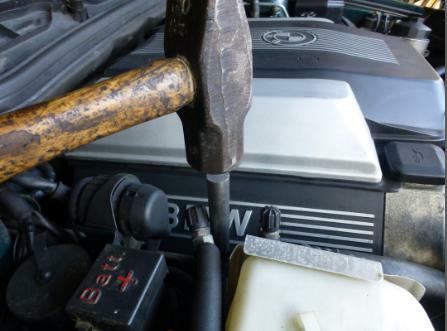 Remove the yoke bolt. 13mm wrenches. It is not sufficient to merely loosen as there is an interference notch on the shaft. 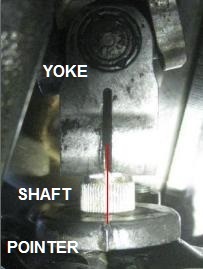 Slide the yoke off the steering box input shaft. It is not necessary to make any arrangements in the cabin. DO NOT pry between the yoke end and the delicate plastic pointer on the box. 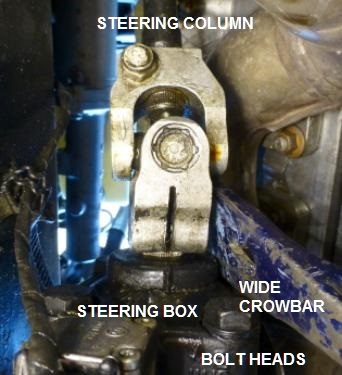 Here we are using a 1-1/2 in wide crow bar wedged between the yoke's upper U and a set of bolts on the steering box. It may help to LIGHTLY tap a thick, flat screwdriver into the clamp gap. DO NOT hammer the yoke directly as it is aluminum and will deform. 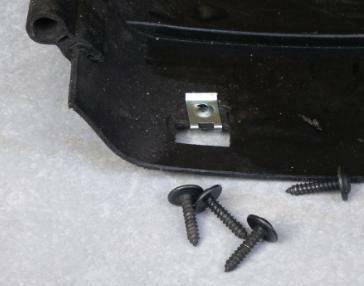 Disconnect mounts from engine cradle by removing 2 nuts each side. Support the engine. Here we have lifted the engine perhaps a half inch, then set it back down on a jackstand with a wood board across the entire front edge of the steel oil pan. This support will see approximately half the engine weight, about 220 lbs. 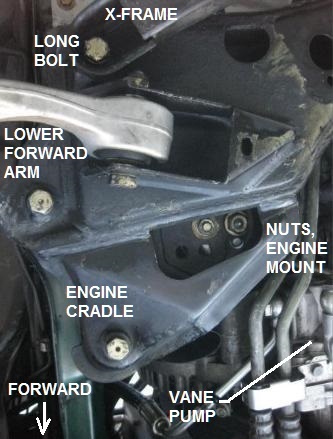 Remove bolt from control arm at the engine cradle. 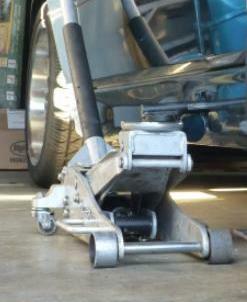 The control arm can swing out of the way to the rear. 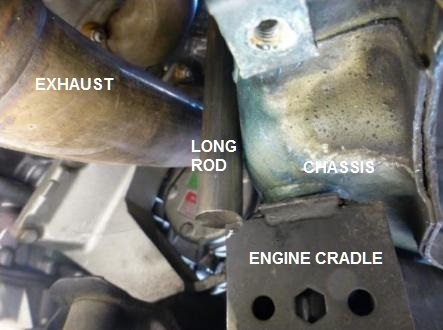 A dowel locates the engine cradle to the vehicle chassis. A heavy hammer on a long rod got it unstuck. 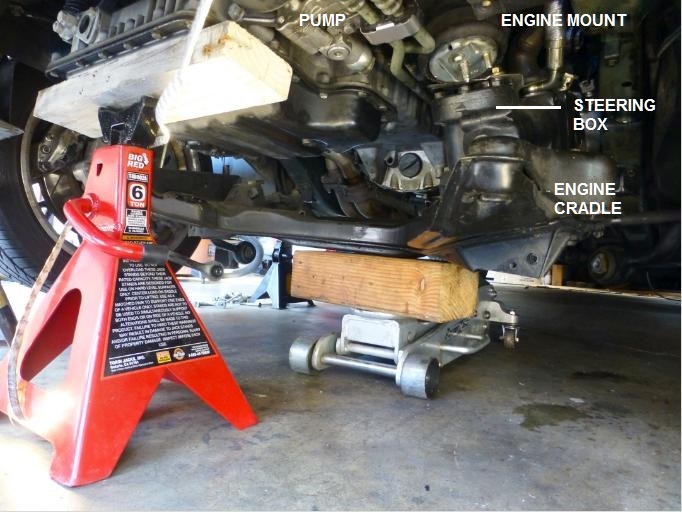 Lower the engine cradle, balanced on the floor jack. 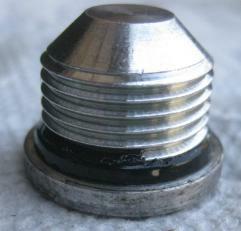 Common balljoint tool. Requires very little effort. Unbolt box from cradle. 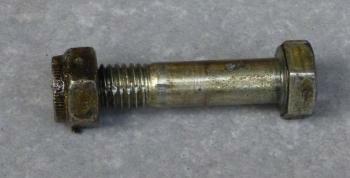 Two bolts plus associated washers and nut. 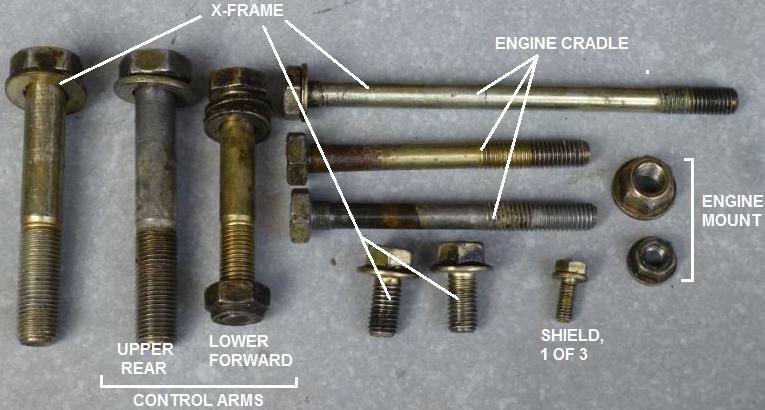 1) During assembly, follow the factory manual for bolt torque values. 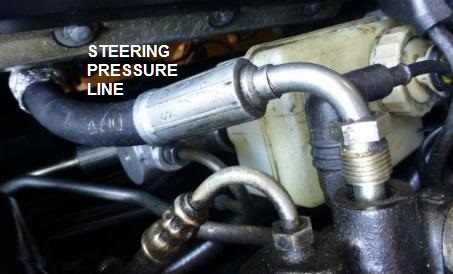 3) As you are returning the steering box into place, manage the pressure line so that it doesn't get jammed up into the engine heads. 4) Line up the column yoke with the pointer on the box so that the steering wheel in the cabin is clocked properly. 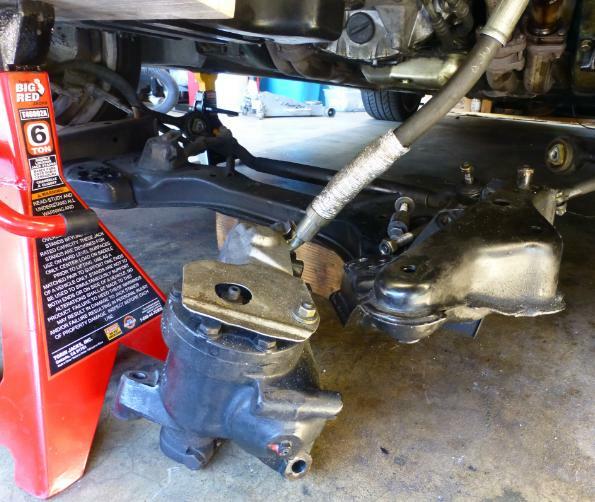 5) The suspension must be fully compressed when tightening the control arm bushings. Since we still require access to the wrenching zone in this low clearance vehicle, this means the tire patch must be elevated. Here I've gotten paranoid about suspension deflection and binding, and so have used dollies to give the tire patch freedom of movement. 6) This spot marks the X, except on very early years. Oooooh, is that an LED strip, used as shop light? Amazing documentation as usual. Only note I would make is that you might suggest 17mm flare wrench for the regulator lines as they are easy to mangle if not delicate in technique. Very helpful for future reference. Thank you. Or you might, as now quoted in the footnote section.